What happens when five creative bloggers are invited to use the HGTV Home Softer Side Palette by Sherwin-Williams, in a room of their choice? Gorgeousness ensues! The Softer Side paint color palette is twenty-five colors that are designed to work in any combination. This new palette is a delicious mix of floral brights and soft accents, balanced by grays. Celebrate colorful inspiration in this stylish slideshow. Ez Pudewa of Creature Comforts performed a stunning makeover of an all-white bedroom with gray and pink. The bedroom has just the perfect light for the rich gray of Sherwin-Williams Peppercorn. The cheery pink accents keep the room from feeling heavy. Love the addition of the black and white striped rug, which brightens up the space. A Gray and pink color palette reflects a perfect balance of light and dark, and is a stylish choice for a master bedroom. How can you add a pop of accent color, when you already have a great wall color in your room? Ez Pudewa of Create Comforts blog added a peek-a-boo of Sherwin-Williams Charming Pink, in the closet. Don't overlook clever ways to add color at home in unexpected ways. Blogger Beth Hunter of Home Stories A to Z had a lovely master bath. When Beth was given the challenge by HGTV Home by Sherwin-Williams to makeover that master bath with their Softer Side color palette, the result was stunning. Beth chose Sherwin-Williams Watery for the walls of the room. This clear and fresh blue is the perfect backdrop for glam accessories, and white accents. This gorgeous bathroom makeover is an illustration of how easily and dramatically you can change any room in your home, with color. Creative bloggers like Myquillyn Smith of Nesting Place are showing us all that dark wall colors can be wonderful in any room. Myquillyn chose Sherwin-Williams Peppercorn to create this intimate and relaxing master bedroom. The room has just enough creamy white accents and natural light to balance the dark gray accent wall. If you look carefully on the left, Myquillyn has cleverly used an repurposed medicine cabinet above the nightstand. 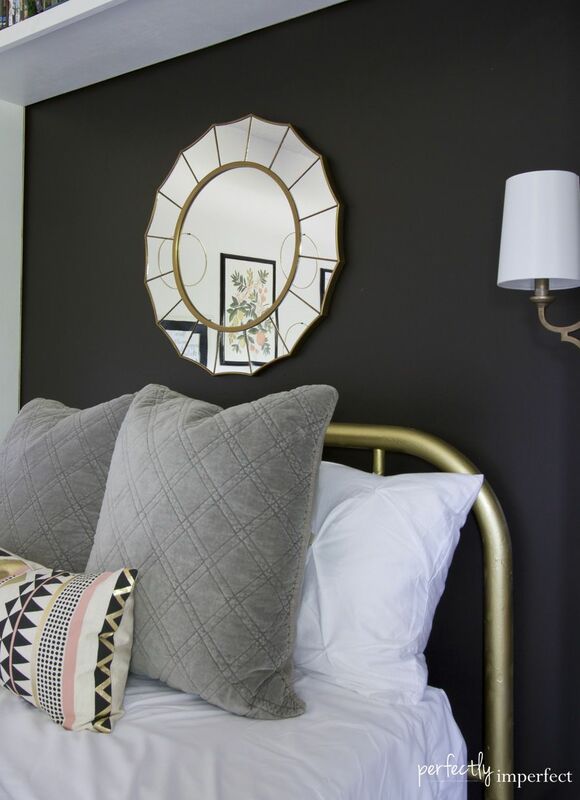 Blogger Myquillyn Smith uses Sherwin-Williams Peppercorn on an adorable thrift shop mirror, to bring color to the opposite side of the accent wall behind the bed. Using your accent wall paint as an accent in other parts of the room is an easy trick for balancing a bold accent wall. Painting accent pieces like mirrors and frames, or even small furniture like chairs and benches, gives any room a pulled-together look. Gina Luker of The Shabby Creek Cottage used three HGTV Home by Sherwin-Williams Softer Side palette colors. Kitchens provide an unique opportunity to use multiple paint colors in one room, without looking too busy. Gina chose Sherwin-Williams Porcelain for the kitchen walls, and the creamy white is perfect with Peppercorn on the cabinets, and Requisite Gray for the island. The pretty kitchen color scheme is complete with aqua and green accents. Blogger Gina Luker of the Shabby Creek Cottage flows Sherwin-Williams Porcelain wall color into the kitchen-adjacent dining area. The aqua and green color accents are repeated from the kitchen to tie everything together. Small details like the silver light fixture, and whimsical numbers on the wall, personalize this sweet space. Blogger Shaunna West of Perfectly Imperfect performs a feat of color magic with this bedroom makeover. Using Sherwin-Williams Peppercorn and Porcelain, Shaunna creates a bright and welcoming space, with plenty of little details that add up to a big impact. Using a darker accent color behind the bed anchors any bedroom in need of a focal point. In this bedroom, Shaunna added shelving around the bed to boost the accent power and create stylish storage. This transformed bedroom is all about livable glam style, but it doesn't sacrifice organization at all. Shaunna of Perfectly Imperfect created a micro-office niche in one of the bedroom closets. To carve a dedicated space out of the gray and white room, Shaunna used Sherwin-Williams Mellow Coral in the closet office space. This little peek of delicious color adds a youthful glow to a sophisticated makeover.